When it comes to sign printing, you have options. A lot of options. So many options that it may even be a bit overwhelming if you don’t usually spend all day thinking about sign materials and printing. But lucky for you, that is precisely how we spend our days. And in an effort to make the printing process easier for you, the reprographics experts at Coastal Creative are here to describe and compare some of the most common sign materials so that you don’t have to. All signs more or less do the same thing: inform onlookers. But despite their singular function, there are huge variations in sign materials. These differences depend just as much on intention as they do on environmental factors. Is the sign going to be displayed in doors or outside? Is it a permanent fixture, or does it need to be portable? Is this a temporary or long term display? How much exposure will this sign have to the elements? 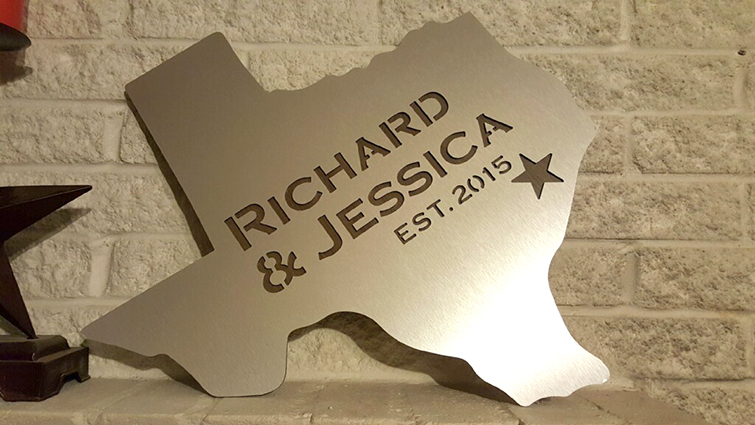 If you are on the market for a custom sign, undoubtedly you have already asked yourself some of these questions, among others. Based on the common questions we receive from customers about sign materials, we have evaluated and compared six of the most common sign materials for your reference. There is no “best” sign material for every project. Finding the perfect sign board material will always depend upon your needs, budget, and intention. The following table will give you a quick overview the central differences between six of the most common signboard materials. Here is a brief evaluation according to cost, weight, durability, core, exterior, finish, and appropriateness for outdoor use. Name Cost Weight Durability Exterior Finish Outdoor Use? Still have questions about these different sign materials? Such as, what is foamcore? What is dibond? What is sintra? What is gator board? Or what is Coroplast? Need a more in-depth explanation of the benefits of each material? Here we will profile these six sign materials, their common uses, and how they compare against the others. Gator board is a rigid and lightweight display material that has a dense inner foam core and a wood-fiber veneer exterior. Gator board is resistant to water, scratches, and dents. Thanks to its portability and durability, gator board is ideal for signs that will need to be be frequently transported. This combination of impact-absorbent interior and rigid exterior gives gator board a great deal of structural integrity, so it will not easily break or warp under pressure. The largest suggested dimensions for gator board are 48”X 96”. The wood veneer makes for highly attractive and vivid full-color prints that are long-lasting and durable to boot. Gator board is not meant to be an outdoor sign material. Although it is water resistant, too much exposure to water will eat away at the wood veneer and eventually the foam core. Gator board is not recommended for outdoor use unless displayed in a cover that shields the sign from the elements. Gator board is not an acid-free material. That means gator board should not be used in contact with artifacts in permanent storage conditions, such as in a museum. Gator board and ultra board can look very similar, but ultra board tends to have a bit more of a plastic-y sheen to it. Both have a foam core, but the exterior paneling on these materials is different. One foolproof way to tell the difference between the gator board and ultra board is to apply pressure at both ends of a sheet: ultra board will bend slightly, but gator board will remain rigid. This warp and bend-resistance makes gator board better suited for projects that require a rigid structural foundation. But because ultra board bends, it is actually the stronger of the two materials, as gator board will reach its breaking point sooner than ultra board. Both materials are intended for permanent indoor use and have similar price points, so your decision comes down to what kind of finish you prefer. Gator board vs foam core is one of the most common questions we get about sign board materials. Both materials offer their own unique advantages and disadvantages, depending on your intended use. A foam core sign and a gator board sign both have a dense foam core. Gator board will have a glossier finish than the matte finish of foam board signs, which may or may not be desirable depending on the lighting in your intended place of display. Foam core signs do not resist denting like gator board, and could easily be punctured with a fingernail. 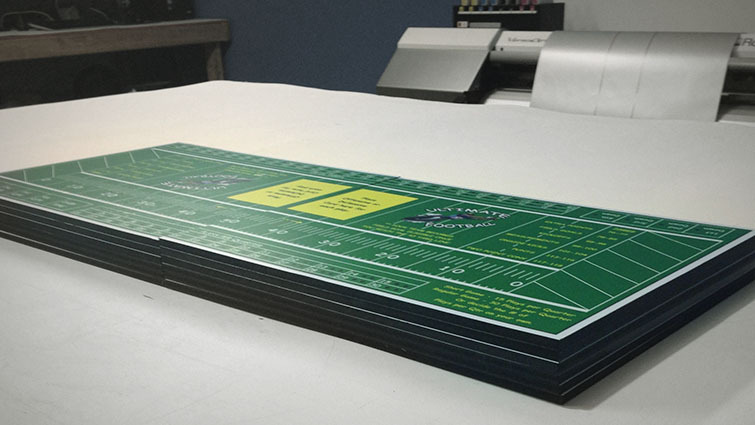 Foam core prints are typically sold at a lower price point compared with gator board, which can be a convincing advantage if you need many prints. In general, foam board signs are ideal for temporary use, but they can be preserved if framed. We recommend foam core signs for single use projects, like a class presentation, or for temporary displays that will not need to be moved after set-up. Gator board works for these sorts of projects as well, but has extra durability. Gator board is the ideal choice for frequent use and transportation such as for trade shows, promotional displays, conferences, or event displays. If you plan on using this sign or print to present more than once, gator board is the longer-lasting choice. While both materials can be painted, the smooth wooden veneer of gator board makes for a better canvas. Sintra material has a bit of a texture to it (think PVC piping), which makes it less ideal for painting. However Sintra sheets are by far the tougher of the two materials, and you would be hard pressed to dent or break the sintra material with your bare hands. This makes sintra board a great outdoor sign board. Gator board should not be used for permanent outdoor displays as it will quickly degrade with exposure to the elements, but sintra sheets can weather rain, snow, and sun. There is just no beating PVC signs for their durability. However, sintra board tends to both weigh and cost a bit more than gator board. If you’re asking your self what Coroplast is, that is the trademarked name for corrugated plastic sheeting. Coroplast board is super cheap, lightweight, and weather resistant, making it the best outdoor sign material for displays or projects that require mass distribution (like campaign signage). Gator board is a more attractive, long-term option than Coroplast for indoor displays. While it is also lightweight, Gator board will warp with exposure to the elements, and is the only dent- and scratch-resistant for light usage. Gator board is also more rigid than Coroplast, which can bend and fold when pressure is applied. If you’ve attended a school science fair any time in the last few decades, you’ve probably seen foam board before. Foam core is a rigid, inexpensive, and super lightweight display material. 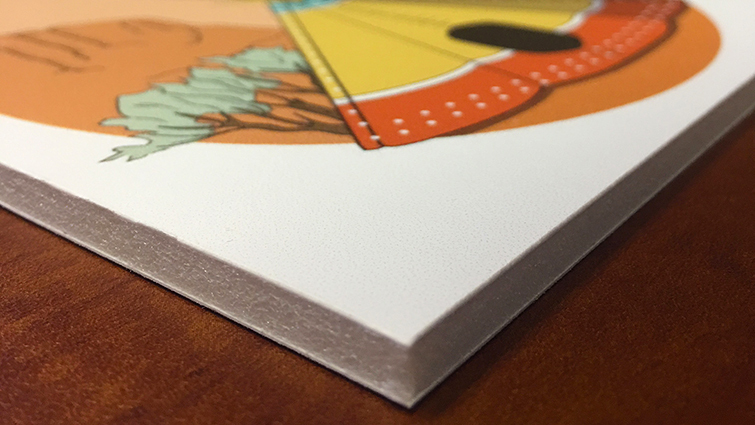 As per its name, it has a dense foam core sandwiched between two layers of thick matte paper. Because it is so low-cost, foam core signs are a great option for temporary displays and presentations. Being so lightweight, it is very easy to transport. The matte finish also makes it ideal for presentations or photo mounting as the surface will not cause glare. If you plan on framing your display, foam core signage is a good option due to its attractive matte surface, lightweight, and inexpensiveness. Foam core is not a suggested outdoor sign material, as water will cause the paper to disintegrate. Foam boards signs are, however, a great option for retailers or restaurant owners who have constantly changing menus, specials, deals, or promotions. They give your display a seek and professional look without much cost. Both of these materials make for great short-term signage and displays as they are both lightweight and inexpensive. The difference depends on where the signs will be displayed. Coroplast is the best choice for outdoor displays as it can hold up well against the elements. Foam core signs, on the other hand, have a paper coating that will quickly disintegrate when exposed to rain or strong sunlight. 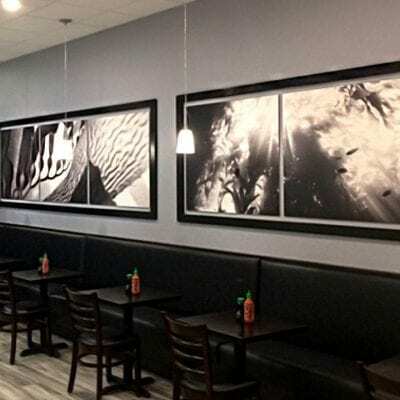 Thanks to the matte paper finish, foam signage tends to be more visually attractive and thus works better than Coroplast boards when it comes to presentations or as a photo backing. Foam signage and Coroplast boards are used in two very different situations. Simply put, foam core signage is your best bet for an inexpensive indoor display, while Coroplast board is your best option for a temporary inexpensive outdoor display. A foam core sign is the cheaper, short-term option between these two indoor signage materials. Ultra board costs a bit more, but it will hold up against basic wear and tear better. Ultra board can also bend when pressure is applied, making it much sturdier than foam signage, which could easily be snapped over your thigh. If you intend for your project to travel and withstand many uses, ultra board will last longer. Ultra board also works well for freestanding or hanging signage. Foam core signs are better suited for a one time use and generally requires mounting or an easel. Ultra board is a heavy-duty, all-plastic panel used for vivid prints and high-use displays. 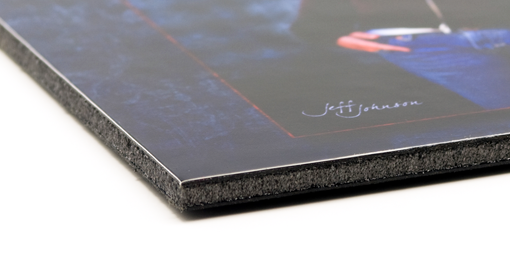 Like foam core and gator board, ultra board also has a rigid and dense foam interior. The difference is that its outsides are made of moisture resistant sheets of polystyrene plastic. The plastic signage material used contributes to its durability. This plastic coating makes ultra board incredibly resistant to scratches, dents, and other wear and tear. The coating is also a flexible plastic, which allows ultra board to bend ever so slightly. This flexibility makes it some of the strongest material available for indoor signs. Ultra board is a great choice for signs that need to be freestanding or hung from the ceiling. Ultra board is also is a versatile and customizable material. It can be used for screen printing, digital printing, silk screening, and even painting. Both ultra board and sintra board are coated in tough plastic, but sintra board has a plastic interior as well. For this reason, sintra board is a lot stronger and slightly heavier. Ultra board will last for a long time indoors, but the materials will degrade with prolonged exposure to the elements. Sintra board, however, could withstand even severe weather conditions. If attractiveness is your main worry, we recommend ultra board over sintra board. While both can be printed with vibrant colors, the base color of the sintra board material tends to be a bit gray, which can dull your print ever so slightly in comparison to ultra board. Ultra board is significantly more expensive than Coroplast, but its appearance is much more refined and better suited for indoor display than Coroplast is. Coroplast board is great for temporary outdoor displays, but it doesn’t have the same polished look that makes ultra board great for permanent indoor signage. Ultra board is also more rigid than Coroplast, which can be folded and creased with enough pressure. But although Coroplast looks a lot flimsier than ultra board, Coroplast is meant for the outdoors. Ultra board, on the other hand, will show wear and tear quickly if displayed outdoors. Outdoor signage needs to be able to withstand the heat, rays from the sun, wind, rain, and other elements. Outdoor signs materials vary from the lightweight and sturdy, to the downright impenetrable. Of course, no sign material is one-size-fits-all: you’ll need to pick the right product for your projects. But we’ve put together some pointers here to make the decision easier. Sintra board is a rigid paneling made from polyvinyl chloride, commonly referred to as PVC. Sintra boards are also known as sintra board PVC signs and is made of the perfect outdoor signage material for permanent use. Sintra PVC sign board can be dyed and printed with any color, but the default Sintra material is generally an off-white color with a low-gloss matte finish. 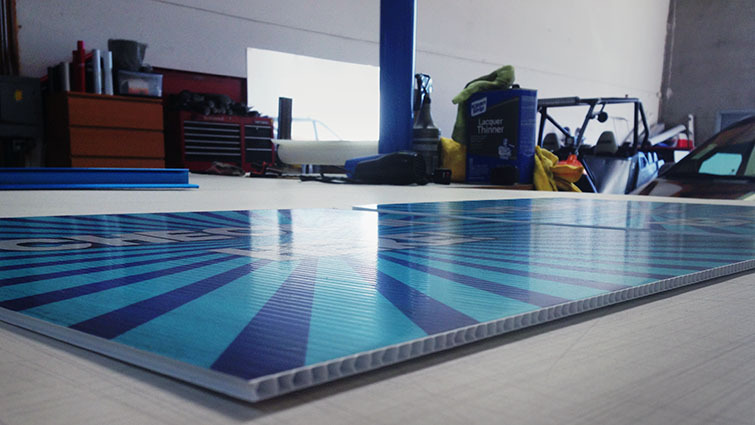 With a PVC interior and exterior, Sintra board is one of the sturdiest materials you can choose for a sign. Its exterior is weatherproof, making Sintra board the best material for outdoor signs that need to endure heavy exposure to the elements. Sintra sheets withstand bending, warping, and breakage better than other sign materials detailed here. 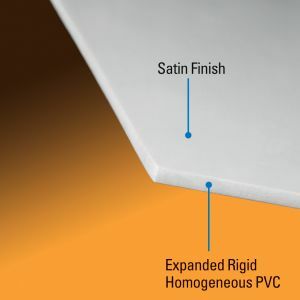 Is there a difference between Sintra and PVC? Not really. Sintra is the brand name for a manufacturer of a specific type of PVC signage material. While there are many different brands and variations of PVC, Sintra has a unique manufacturing process that makes them the gold standard for PVC sign materials. Gator board is the more attractive option, with its wood veener. But Sintra is unquestionably the better material for outdoor signs. Coroplast is often a bit translucent, where Sintra sheets are completely opaque. Due to its corrugated plastic interior, Coroplast is incredibly light weight. However Coroplast will fade and show its age after too long outdoors, and can bend and warp under pressure. Sintra board is heavier, but being completely solid, it is a tough material that will not degrade with outdoor exposure. It can also endure heavy pressure without warping. Both sintra board and dibond are made of durable sign board materials. If you are interested in a neutral-colored plastic sign board, sintra board is an excellent and durable choice. Equally durable is dibond, but the appearance is completely different. The aluminum coating of dibond has an unmistakable metallic sheen. Dibond is also much easier to cut, where sintra board is a bit tougher to make intricate shapes out of. This makes dibond better suited for stencils and lettering than sintra sign material. Coroplast is the brand name of the most popular manufacturer of corrugated plastic sheets. Corrugated plastic is essentially plastic cardboard. 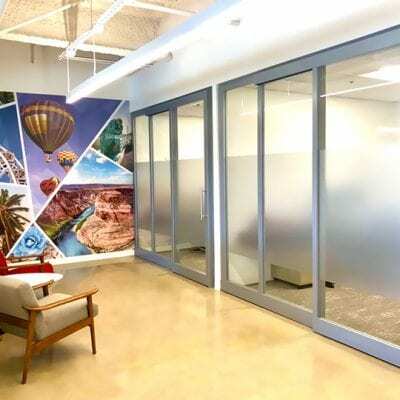 The zig-zagged plastic interior is sandwiched between two smooth sheets of plastic that serves as the exterior making it a good outdoor signage material for temporary use. This sign structure makes for a durable plastic sign board. Ideal for indoor and outdoor graphic applications. Tougher than corrugated fiberboard, lighter than solid extruded plastic, waterproof, weather resistant and stain resistant, Coroplast is the material of choice for the screen printing industry. Coroplast is inexpensive, ultra lightweight, and is also resistant to the elements. This combination makes this plastic sign board a popular choice for temporary outdoor signs, mail carriers, and other creations that need to be both durable and cheap. Coroplast will not look its best forever when displayed outdoors, but it can certainly endure several months of rain and sunshine. If you need to distribute your signs far and wide, lightweight, inexpensive Coroplast is a great choice. Coroplast will degrade with heavy usage, but it is far more durable than foam core. A foamcore sign could easily be snapped over your knee and is prone to dents and scratches. None of these issues are a concern with coroplast, but the translucent plastic material does not always look great for presentations or displays that require a higher degree of polish. For gentle indoor use, foam core signage is the more attractive choice for about the same price. While both materials can be used outdoors, they are vastly different in appearance and effect. Dibond material will last for years and is best suited for shop signs and mounted company logos, though it is often used for high-end real estate signage. Coroplast does best as a short term sign solution, like for construction sites, election signs, or for sale signs. Dibond material can be cut precisely and easily, but Coroplast doesn’t retain its structural integrity when cut with intricate detail. Dibond® is the industry’s leading aluminum composite material (ACM) for more than 15 years. 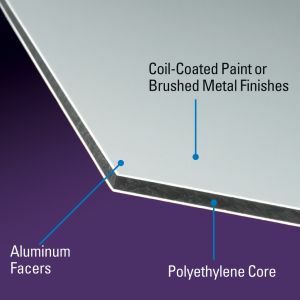 It is comprised of two pre-painted sheets of .012″ aluminum with a solid polyethylene core. Made In USA. Dibond signs consist of two sheets of aluminum composite encasing a solid polyethylene core. Polyethylene is the world’s most common plastic, used in a wide array of household packaging and products. This combination of metal and plastic makes Dibond material at once incredibly durable and pleasing to the eyes. And because both the interior and exterior are solid, Dibond signs can be cut to any number of intricate shapes without losing structural integrity. This makes Dibond great for mounted typographic signs or signs that require stencil cutouts. Dibond differs from aluminum signage in that it has a plastic core, making it lighter weight and more shock absorbent than regular aluminum. Dibond is a great advanced material to use for long-lasting products that can stand the test of time. Great information, and well presented. I need foam or coroplast, 4 inches by 8 inches, 3/16 or 1/4 inch thick, printed on one side. Maybe 100 pieces for my prototype. Can you cut small pieces? Holy mackeral! This is one of the best comparisons of the confusing world of sign products I’ve ever seen. I usually just walk into a FedEx Office for small projects or a one off printer, but this really opens up my eyes to the possibilities of what’s out there. A lot to take in…a lot of projects to do.